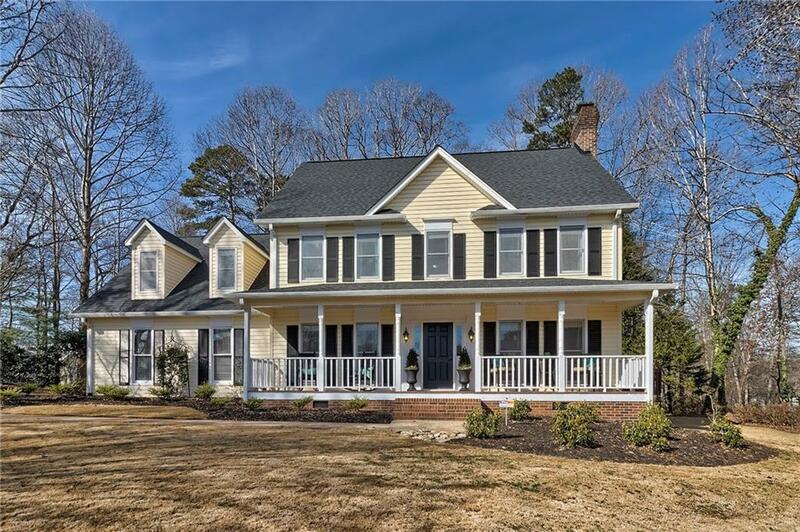 Beautiful Southern traditional charmer with 4 bedrooms, 2.5 baths located on a cul-de-sac in the desirable Huntington North neighborhood in Easley. This 3,125 sq ft home has been meticulously kept and recent updates/upgrades include a kitchen remodel with stainless steel appliances and double oven, popcorn ceilings removed on first and second floors, most lighting fixtures and ceiling fans upgraded, new exhaust fans with heat in full baths, crown molding added in most rooms, all cabinets resurfaced/painted with new doors and hardware, new HVAC for second/third floors, and much more. Situated at the end of a quiet street, this home has a lovely landscaped yard and rocking chair front porch. Perfect for a family and entertaining, this home features a formal dining room; spacious, yet cozy den with gas log fireplace; sunroom and amazing kitchen with breakfast area. The kitchen is light and open and has stainless steel appliances, a double oven, lots of cabinets for storage, granite countertops and a unique island. A laundry room completes the first floor with shelving, cabinets and a drying bar. The second floor has four bedrooms and two full baths. One of the bedrooms could be an additional bonus room. The master bathroom features two closets, double sinks, granite countertops and a shower/tub combination. The large third floor is truly a bonus and could even be used as a fifth bedroom since it has a closet. This limitless room is perfect for a man cave, teen hangout, office, or craft room. A fenced back yard is perfect for pets, children or entertaining. This beautiful home is zoned for excellent schools, convenient to everything Easley has to offer, and has no neighborhood HOA. The storage building and playhouse may convey with acceptable offer or may be purchased separately. Seller is offering a $4,000 allowance for some broken seals in windows, deck refinishing or to use as buyer chooses. Buyer and Buyer's Agent are responsible for verifying all information including taxes, schools, square footage, acreage, etc.